A man who may be North Texas' first Indian-American elected official was sworn in Monday night. George told CNN on Monday that he came to the United States from India in 1989 to study at Texas Tech University, where he received a Master of Science degree in mechanical engineering. He said he thinks he’s the first non-Caucasian ever elected to the Sunnyvale Town Council. He said, “It’s a significant achievement - an historic moment. In North Texas, no Indians have ever won an election, as far as I know. People live and die here, so for an immigrant to come here and be accepted - I got 70 per cent of the vote - it says a lot about how perceptive this community is for new ideas.” George said his main goal is to bring quality businesses to Sunnyvale, population 4,000, that will have a positive economic impact, but not change its small-town character. UN Secretary-General Ban Ki-moon, Transportation Secretary Ray LaHood and U.S. Ambassador to the UN Susan Rice are scheduled Wednesday to launch a global campaign to address the dangerous and growing problem of distracted driving. The 15-year-old race car driver from Stockdale, Ohio, is doing his part. According to his website, Veach is trying to persuade all 33 drivers who qualify for this year’s Indianapolis 500 to sign Oprah Winfrey’s “No Phone Zone” anti-texting-while-driving petition. The 5-foot-2, 95-pound USF2000 National Championship driver plans to join the IZOD IndyCar Series as a competitor once he graduates from the three-year ‘Road to Indy’ training program that he’s now in. On his 16th birthday this December, he’ll publish his first book about the life of teenagers, which will include a chapter on safe driving. Veach now has a special license that allows him to drive on race courses. Next month, he’ll apply for his Ohio driver’s permit. The Manville, New Jersey, driver has a sense of humor, even if the Motor Vehicle Commission isn’t laughing. The website NJ.com reports that the 49-year-old is known in her small town by her dark blue Chrysler convertible; more specifically, because of her personalized license plates. For four years, the plates have featured the letters “BIOCH.” After one complaint, the Motor Vehicle Commission has now recalled her plates, and they won’t renew her registration in June unless she surrenders them. "It’s not offensive," she said. "It’s not even a real word." We're going to remove the internet access from the break room if you keep spewing this type of rhetoric on company time. Everyone moves here and want to change it to the same place they left. The first thing they want to do is convert everyone to their nut house religion. That was the only mistake our founding fathers made. Most wars through history were fought to convince someone that they are right and everyone else is going to hell. I figured out real quick when I was taught about giving ten percent to the church that one man would not have to work. Liberalism from the start. "Everyone moves here and want to change it to the same place they left." Dude, SO DID THE FOUNDING FATHERS. Do you think white people just 'appeared' here? They came here from England (and then other places) so they could found their own country *with their own state religion*. They had no intention of having religious freedom, until it became clear that the colonies would have to band together to make unity possible. It was then that they came up with the policy of freedom of religion. The First Amendment say: "Congress shall make no law respecting an establishment of religion, or prohibiting the free exercise thereof;" This does not mean only religions you like or ones that agree with your doctrines. It is any and all. If someone wants to worship a chicken, they may, and there's not a d*mn thing you can- or should- do about it. People need to quit worrying about race and color.Eventually we will all be the same color.We will have to find another reason to blame our troubles on. Don't tell me what's "intriguing" you college intern morons! Aren't we ALL supposed to be from Africa? Wouldn't that be an oxymorn if I agreed with the Tea Party small government/low taxes platform and be called a racist? Personally, I don't care what country you're from or what color your skin is; I just want you to obey our laws and educate your children to be productive good citizens of this country. Isn't the "new" color green, and not black or white (brown or yellow too)? Silly discussion. I am from Scandianvia and I am called Caucasian and my "people" have never been in Caucasia. It is same as with latinos. Are they from Latin? In the 1800s some people from the Punjab (a region in India), after having been here in the U. S. for many years, applied to become U. S. citizens. At that time only caucasians could become U. S. citizens. When denied citizenship, the Punjabis took their case all the way to the Supreme Court, claiming they're caucasians and therefore should be given citizenship. The Supreme Court ruled that, although the Punjabis may have a caucasian origin, everyone knows that there are profound differences in appearance of these people compared to the caucasians from Europe, and therefore it was right to deny them citizenship! It never ceases to amaze me, this ignorant bias, so based on ignorance! Yet, if you were in surgery and suddenly started to bleed, they would call for blood from the blood bank and ask for your type of blood or something suitable like O neg....this blood could come from anyone of any race...the bags are never maarked by race of donor...doesn't this tell you something? We are humans,we share the 2 major blood antigens, and my Indian blood can save the life of an Arab, a Chinese, an African and even the life of an ignorant biased American, no matter what the color. Life is life, blood is life. Cheers to life and here's to freedom.! Bigots and bigotry be gone!! Julie, I agree with you completely. We ARE all humans. Look here, this concept of immigration is ridiculous when its being put about now. EVERY person in this country is an immigrant, with the exception of the First People, aka. Native Americans. We all have suffered several hundred years of bloodshed and persecution going one way or another. We should put away these ridiculous ideas of division through color, or race, or religion. Every religious group has suffered persecution at one time or another. We DONT have to follow the paths of the rest of the planet. We are supposed to be free to keep our personal beliefs to ourselves and work together for the good of the community! 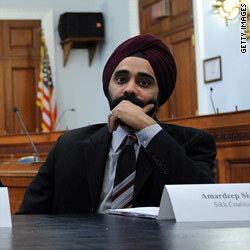 Mr. Singh welcome to the boat, you are not the only one HOMBRE racial profiling is becoming a career in this Great Nation. Perhaps we should think of founding a school that teaches how to profile those that are being unjust towards you ans I.